From a NY Times feature in the year 2000 that described the--at the time--REVOLUTIONARY idea of banding some of Long Island’s top music acts together to help promote the local scene, Pop Conspiracy Productions has since created a benchmark that has continued to influence bands bringing their resources together to promote each other's efforts as a collective unit. Now, as almost two decades have passed, P.C.P. will reunite once again with the bands that started it all - This Island Earth (performing their 25th Anniversary show! 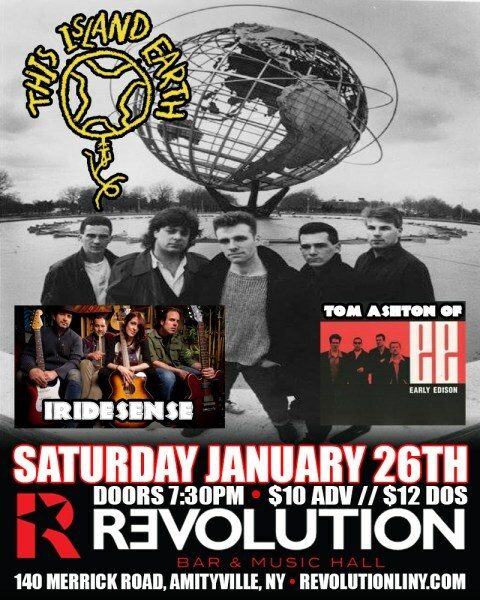 ), Tom Ashton of Early Edison, and Iridesense at Revolution Bar & Music Hall in Amityville on Saturday, January 26th at 7:30PM. As described by the NY times “There is strength in unity, and through P.C.P., the bands pool their resources through joint advertising and shared mailing lists.” which in the days before online mediums like Facebook, Soundcloud, Reverbnation, and Bandcamp took a great deal of initiative. Now the collective that kept the scene alive through creativity and sheer determination is getting ready to come together once again to light up yet another Long Island stage. Find out more about some of the groups that stood the test of time below! The growth of This Island Earth, both musically and professionally, has been a logical escalation. Formed from the ashes of former cover bands and mullet-headed metal outfits, the group joined forces through a well-placed ad in the Village Voice, taking their moniker from a popular sci-fi 50's film of the same name. The band's eponymous debut was released on Neuro-Feed Records label and was sold and distributed primarily through consignment and live performances. Although it was only promoted to 12 east coast regions, the CD managed to gain 15 Top 40 college radio positions on over 180 stations, selling out it's initial pressing. Their follow up EP release, "Home Sweet Home," brought even further attention to the band, once again selling out its first pressing. The CD achieved over 50 Top 40 chart positions on over 350 stations nationwide and yielded a Top 20 ADD spot in its first week of release. The single, "Edge of Tomorrow," appeared on CMJ Certain Damage Sampler Vol. 103, as well as in the independent film, "Putnam," and also made many Top 10 radio lists for Top Songs of the Year 2000 (WCWP, WUSB). The band has also received extensive press coverage in Newsday, Billboard, and The Voice, and has opened for veteran acts 10,000 Maniacs and The English Beat. Early Edison is a popcore band from Long Island, NY. Tom Ashton and Rob Coffin formed the high-energy pop outfit in the late '90s with drummer Chris Santiago and bassist Tom Wendling. Having plowed through pockets of the Midwest and East and West Coasts, the band made a name for themselves thanks to their lush harmonies and catchy pop tunes. Their single "Demographically Pleasing" from Devotion & Deceit was chosen as Pop Song of the Year by Newsday in 1997. Three years later they teamed up with Tony Maimone (Pere Ubu, They Might Be Giants, Bob Mould) to release their self-titled sophomore effort. Iridesense (1993 - present, which includes Rick Eberle on Vocals/Guitar, Tara Eberle-Drouin on Vocals/Bass, Rich Drouin on Drums, Rob Viccari on Guitar) has toured the US opening for major acts such as Gin Blossoms, Spin Doctors and Sugar Ray and placed songs on the Nickelodeon Network shows Drake & Josh, Zoey 101 and iCarly. The band has several independent label releases - Cool Dream Tomorrow (1997), Iridesense (2001), A Trip Called Life (2007), Secret Constellation (2011) and Thought Parade (2015). As they get ready to bring the same energy and inventiveness to the stage at Revolution Bar & Music Hall on Saturday, January 26th as they did in the early days of their inception, Pop Conspiracy Productions will surely put on a great show!